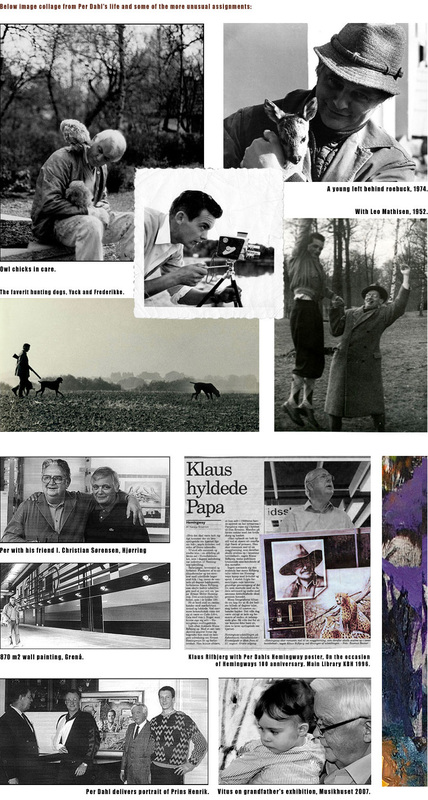 Per Dahl is born the 9th October 1930 in Ebeltoft. His parents owned a renowned restaurant called the Forestpavillon, a treasured place for entertainment and eating, among musicians and artists of the time, like Leo Mathisen and many more. It was here the desire and inspiration to express himself through music, drawing and painting especially, was born. The young boy's talents were noticed when he drew and scribbled on the restaurant's table paper cloth. He therefore received a painting box from his parents, at the young age of twelve, and one year later during the war, he became the apprentice of the local artist, Ejnar Olsen. Following war's end, a sixteen year old, adventurous Dahl sat sails as deckhand with course for South America and later Canada. After several years of traveling, he returned to Denmark, via North Scandinavian, where he later in Sweden, met his life's companion, Janet, who he has spent the following fifty years with. They have settled near Ebeltoft, and it is from this base that Dahl still travels out in the world, especially to Africa. In order to embrace his other passion, that of nature, wildlife and hunting, which Africa possesses in a greater scale, Dahl has been drawn to this grand continent, and the influence of Africa shows in his paintings. Hunting trophies from both abroad and home, tells the story of Dahl's luck as a hunter. In Denmark however, the aim and goal has not always been a specific prey, but rather the joyful and satisfying collaboration with his skilled hunting dogs, in their right element. However, Dahl is as often armed with binocular and camera in his pursues of wildlife, and studying birdlife in particular is a passion. He is known for his successful caretaking of sick and abandoned young birds from sparrows, falcons and owls - and birds has indeed become a regular element in his paintings. The first impression that meets you, when you enter Per Dahl's atelier, is music, sometimes classical or Swedish Folk music, but mostly jazz music on a high volume, has become inseparable part of the creative painting process for Per Dahl. After more than 50 years of industrious, daily work with the colors and the motives, the creative process has become a course and natural part of Per Dahl's life, a necessity along the line of getting up in the morning. You don't get any closer to perceive the brush and the man as one. The many years of experience, has given him a superior and ease performing the painting craft, the art flows freely and effortless from his hand.